GOOD VIBRATIONS is a new design Beneteau Oceanis 55 with three ensuite queen cabins and forward separate crew quarters. All cabins have separate air conditioning units and electric fans. The saloon sofa converts to a large lounging area when watching DVDs and inside dining seats 7. Having operated solely in the Grenadines, GOOD VIBRATIONS and her crew know the area well and whether you plan to one way sail down the island chain or just take short hops between the southern Grenadine Islands, you will definitely find the off the beaten track options for snorkelling, exploring and enjoying the islands. For the more active, she is equipped with paddleboards, kayaks, snorkelling gear, swimming platform and large rib tender for exploring. The captain is happy to let you have a go, sail and learn on board also so if you have enthusiastic members of your group, they will always be entertained and kept busy! For those who want a more chilled vacation and prefer to relax, GOOD VIBRATIONS is equipped with a fully shaded removable cockpit canopy and sunbeds, hammock and deck loungers, fusion music system, lifting TV and dvd player as well as the beach matts, umbrellas and chairs for time ashore. Experienced divers can use dive gear on board on request for a rental fee of $30US/day. Captain Oliver and Chef are looking forward to welcoming you on board Good Vibrations. Captain Oli, is an easy going and laid back person. 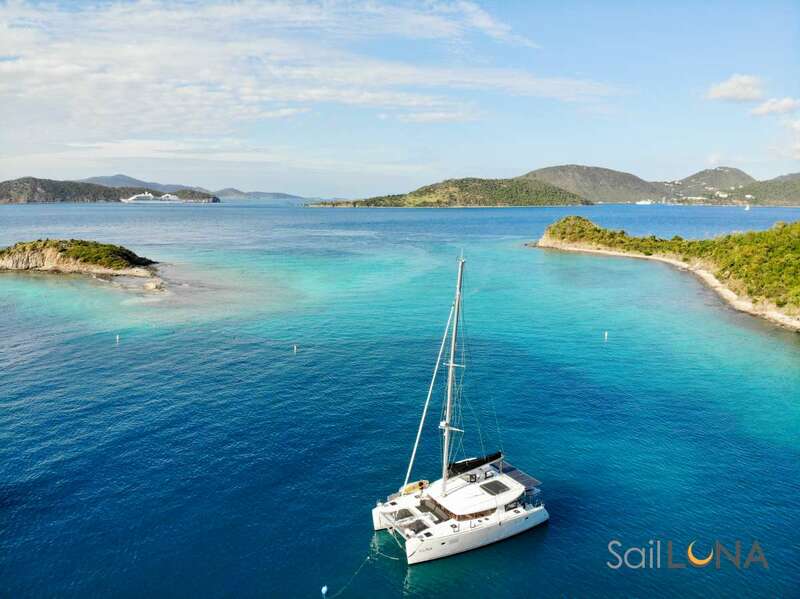 His experience with yachting has taken him throughout the Caribbean, both chartering and sailing aboard his own boat. He sailed across the Atlantic on his own vessel and his experiences in the water have given him the ability to be a knowledgeable and skilled sailor. His passion for spearfishing, diving, snorkeling, and exploring has given him the enthusiasm to take others out too. Captain Oli has been sailing on board Good Vibrations for the past 2 years and has done an extensive amount of passages between the Grenadine islands. He loves taking guests to the best anchorages with views, and secluded beaches for the best spots to swim with turtles. For guests who want to learn, they have the opportunity to learn to adjust the sails, change tacks and trim sheets as Captain Oli is happy to teach. Growing up in France, he enjoys good conversation and good food. Offer: 15% off Good Vibrations crewed charter rates for all charters booked for 2020 (excluding xmas, easter and new year week). Send us an inquiry to get specific pricing for Good Vibrations. 18 Nov 2018 Olivier is truly amazing. We had a great week sailing. Olivier is a truly amazing skipper. He looked after our every need. Thank you to you and Katie for arranging the holiday of a lifetime. We had a fantastic experience and would definitely sail again. We chartered a new Beneteau 55 for 5 days/4 nights in the Grenadines. The boat was nice and fit our family of 4 comfortably. Our captain, was great and very easy going. He planned a good itinerary and was flexible as to what we all wanted to do each day. If you want to learn to sail he will teach you a lot or you can sit on the deck and enjoy the sun, views and rum. Our kids, ages 8 and 11, loved the trip from snorkeling with turtles in the Cays. The food was fresh. We started the trip from PSV and sailed around Union, Mayreau and the Cays. I think next time we would want to do a 7 day trip starting in Bequia and head down to Union or even Grenada. November 2018 - Wonderful people and beautiful islannds. We had a wonderful time in the Grenadines, wonderful people and beautiful islands, seen at their best from the sea. We would all like to thank you and your team for making Russell’s birthday one to remember, the cake was lovely. Ollie was great, he had wonderful knowledge and we would not have seen so much of the islands without him. He fitted into our group easily, cooked dinner for us all one night and made the holiday very special. The boat was lovely, comfortable and met our expectations. October 2018 - Vivian, always bright, cheerful, upbeat and undaunted. June 18 - Thank you! June 2018 - Meals were delicious. The captain´s professional approach to sailing and Rachel’s passionate enthusiasm for cooking made for a truly memorable experience. They were great company. Overall the boat was very comfortable, clean & well maintained and provided us with the level of luxury we were hoping for on our journey through the Grenadines. Clearly the boat was laid out for up to six guests, so for the two of us it was very spacious. What can I say about Bequia, Tobago Cays, Union and all the other islands that make up the Grenadines and Grenada? They were magnificent and sailing through these magically islands is the only way to really appreciate them. The beautiful scenery, the clear waters, the warm climate, the friendly people, the beaches,… I could fill many pages with positive things to say. Everybody should take the chance to drift through the Grenadines and sample the magic. our imaginative head chef Vivian constantly entertained us with the varied fare cheerfully cooked in the galley of our 55 ft sailboat. Spirited Vivian, always bright, cheerful, upbeat and undaunted. After days and nights of fierce lighting, 15 ft waves, wind gusts over 50 in torrential rains, Vivian did not hesitate the next day becalmed in broiling sun to volunteer to be hoisted up the 70 ft mast to repair a broken stay. I could not have asked for a better shipmate, and professional crew. I am without reservation, happy to recommend Vivian most highly.